The most basic definition of a denture is basically just two pieces of plastic or other material used in place of teeth used to grind and mash food. A bit simplistic and outdated, but for someone without teeth, it’s better than nothing at all… or subsisting on a liquid and soft foods diet. Better than nothing, but dentures are dramatically inferior to natural teeth. Chewing ability is impaired and quality of life is diminished. Many denture wearers express feelings of being old and unattractive – and dentures cause a host of problems. Reabsorption of bone where the teeth were anchored leads to dentures not fitting well, resulting in sore spots. Regular adjustments of the dentures can help for a while, but bone is often eventually reabsorbed to the point where the dentures just aren’t going to fit anyway. Ill-fitting dentures can also allow small bits of food to get between the denture and the gum, causing soreness, aching jaws and even earache. Many people go through a great deal of dental work, with the accompanying pain and expense, before they eventually lose so many teeth that dentures are necessary. Dentures were so common in generations past that many people believe that it is simply part of the aging process. They believe that once in dentures, there’s no going back. While it’s true that you can’t grow a new set of teeth, dentures are not the only solution. Dentistry today offers several alternatives that are superior to traditional dentures and can improve quality of life for many people, and they are all based on implants. A couple of decades ago, implants were considered to be radical dentistry and many dentists looked upon them as quack dentistry. Since then implants have advanced so much that modern implants, when the procedure is done correctly and the implant is well-integrated, they work to improve quality of life over dentures in more that 95% of patients. Implants can be used to augment dentures or even to replace dentures. There are three basic ways implants can be used in place of traditional dentures. The first method uses two to four implants with male pieces that fit into female counterparts fitted onto the denture. Basically, the dentures simply button onto the implants, holding them firmly in place. This method results in dentures that can still be removed as needed by the wearer. Essentially, this is just a more secure version of the traditional denture, but still a huge improvement over dentures that can slip and rub on the gums, causing painful sores. The second method involves placing implants in every spot that has available bone and placing bridges and crowns to replace the lost teeth. Also a huge improvement, this method is quite extensive, using more implants than some other methods. 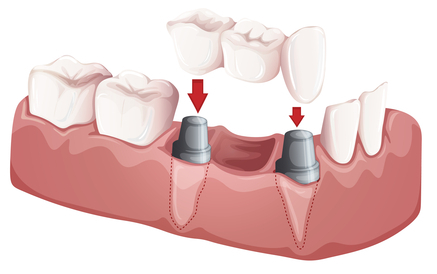 The final method places four to six implants and adhering them permanently to a complete set of teeth. This method uses a solid bridge that is fixed in placed and not removable by the wearer. The major advantage of this method is that it does not require as many implants as replacing individual teeth or using small bridges. The main consideration in deciding to place implants is healthy bones and enough bone in the area where the implant is to be placed. Most patients have healthy enough bones to get implants, but not all of them have enough bone to integrate with the implant. When implants were first introduced to the market, they were very long, about 18-20 mm or around ¾ inch, making them quite invasive and requiring more bone than a lot of patients had available. Dental implants have grown smaller in recent years and research shows that smaller implants integrate better and last just as long or longer than their lengthier counterparts. 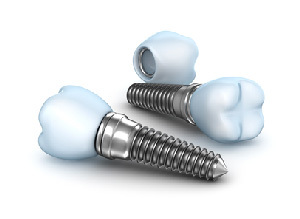 Today most implants are about 10-15 mm or about ½ inch long. Much smaller than they used to be, these implants are still a bit longer than necessary and still need a significant amount of bone to integrate sufficiently. Some offices use bicon implants, which are significantly shorter than other implants and surprisingly well-designed. They are about 6 mm, or just under ¼ inch long and offer a significant surface for the bone to grip. Recent research suggests that not only are these implants less invasive than others, but they integrate more effectively than longer implants. These smaller implants are less invasive than longer implants and require less bone to integrate. For most patients, this results in a shorter recovery and less pain. Because the implants are so much smaller and require so much less bone to effectively integrate, the possibility that a patient will need bone grafts, sinus lifts, nerve repositioning, or other invasive surgery is much less. Because of this, some patients who might have been poor candidates for dental implants in the past may now be able to toss their old-fashioned, ill-fitting dentures for good. As soon as the implants are integrated and the new teeth are in place, patients experience a dramatic difference in how they look and feel. Simply being able to smile again without feeling self-conscious is a huge relief to many patients.